Leica has broadened its range of cameras targeted towards enthusiasts users with the introduction of a new compact system camera, the Leica CL. Stating that the model provides ”the ideal balance between state-of-the-art technology, mechanical precision and compact construction” the CL appears as a sister model to the recently launched TL2, whose feature set closely resembles that of the new CL. Built in Germany, the camera is designed with the same L mount as the TL2, which allows it to be used used with the same TL line of optics. It is, however, also possible to use the body in conjunction with SL lenses without an adapter, and with M- and R-series lenses with adapters. In contrast to the more futuristic design of the TL2, the CL adopts a more classic styling that's reminiscent of the company's X2 model, with anodised aluminium top and bottom covers. A hot shoe is also on hand for those wishing to use external flashguns. The top plate sports dials aperture, shutter speed, exposure compensation and ISO adjustment, and a small LCD in between these to display these values. As is typical for such displays, this can also be illuminated for use in low light. On the inside there's a 24.2MP APS-C sensor that captures images in both Raw (DNG) and JPEG formats, with the camera capable of shooting images at 10fps for up to 33 simultaneous Raw+JPEG files (or 140 JPEGs). Like the TL2, the camera is also capable of recording 4K video footage up to 30fps, with Full HD videos recorded at a maximum 60fps. Other key features include a 2.36million-dot EyeRes electronic viewfinder, whose technology is said to have been developed specifically for this model. It boasts a 0.74x magnification and latency time "below the threshold of perception", while the 20mm eye relief is said to make it comfortable for those wearing glasses. Underneath this is a 3in LCD screen that's responsive to touch, while the camera's focusing system also echoes that of the TL2, with a 49-point configuration that works on the contrast-detect AF principle. Built-in Wi-Fi allows the camera to send images and videos to smart devices and computers, with a Leica CL app designed for both iOS and Android devices available separately. This app also allows the camera to be controlled remotely from these devices. Leica is also introducing a new 18mm pancake lens, the Elmarit-TL 1:2.8/18 ASPH, which will be available as one of the kit options with the new model. This, according to the company, is the smallest pancake lens designed for APS-C sensors, with a weight of just 80g and sufficient lens coatings to make a hood unnecessary. 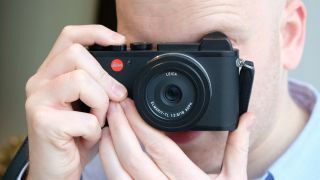 The Leica CL will be available from the end of November in both body-only and kit configurations. One kit will include the Elmarit-TL 1:2.8/18 ASPH lens, while another will have the Vario-Elmar-TL 1:3.5–5.6/18–56 ASPH as its kit optic. The body will be priced at £2,250/$2,795, while the body and 18mm pancake lens kit will have an asking price of £3,150/$3,795. The Vario-Elmar-TL 1:3.5–5.6/18–56 ASPH kit option, meanwhile, will be priced at £3,275/$3,995. A range of accessories to complement the model will also be launched alongside. We'll update this with pricing for other territories as these become available.